MANILA, Philippines – Who would have thought about it? This is the first time that Ateneo is atop the team standings. FEU and UP tease with their talent and potential yet fall. And UST continues to impress. With the crazy results of the weekend, we have more things to glean from the results. This is a season where no one can really predict what is going on. Okay, a lot of people thought that Ateneo would have run roughshod over the league, but it took a win over UP plus losses by Adamson and FEU to claim that spot for the first time all season long. A second consecutive loss after FEU and now to DLSU. Talking to the Soaring Falcons’ Jonathan Espeleta after the game, he pointed to his personal inconsistency as well as the overall lapses as the culprit for the back-to-back losses. They will have to make their adjustments real quick because it is going to be hell week for them because they play two games in the span of four days. They play a NU team that is looking to get on a win streak and La Salle once more. The Fighting Maroons lost their first two games of the season, won three straight then dropped two straight to fall to 3-5. FEU, on the other hand, won two, lost two, then won three straight before taking in another shock loss to UST. I was surprised to see Bright Akhuetie coming off the bench for UP. While it wasn’t ultimately a factor, it showed that without that middle presence, the Maroons struggle. As for FEU, this is a tough loss. And they will in all likelihood lose Arvin Tolentino for a longer spell as he is ejected for the second time in consecutive games. The Tams were poised to pace the league after their huge win over Ateneo last week, but to give you an indication of what a loss does to a team — they went from first to third. If you are a fan of any particular team, you get antsy with this topsy turvy play. But if you like college hoops in general, this is good for the game and the league. The Tigers’ huge 78-70 repeat triumph over FEU proves that the first round win was no fluke. I would have thought that the Tamaraws would come out with their noses smoking and revenge in their eyes. Instead, they collapsed once more and Arvin Tolentino is tossed for the second consecutive game. The Espana-based cagers have hunkered down and batted down the hatches and played great team ball. Zach Huang continued his strong play from his break out summer to lead UST and win the battle inside against his taller FEU counterparts. This is a game where the veterans (Huang, Marvin Lee and Renzo Subido) and rookie-in-the-raw Germy Mahinay carried the team as rookies CJ Cansino and Macoy Marcos and Ken Zamora struggled. The ironic thing is that FEU had more fast break, turnover and inside points, yet the tenacious inside play of UST saw them shoot 27 free throws to FEUs 13. And Huang and Mahinay typified that toughness by going to the line for a combined 17 times. With this win, the UST Growling Tigers have climbed to an even 4-4 and fifth spot. Remarkable. You can only imagine the confidence and belief that is growing day by day in this team. During his UAAP debut two seasons ago, Tio shot down UP with 20 points. Since that game, he hasn’t done much. But with Matt Nieto out, Tio stepped into the starting lineup and delivered big time. His strong playmaking and leadership gave Ateneo poise against UP. His shots were huge and his attacks daring. Tio finished with 12 points, 5 assists, 2 rebounds and 2 steals and get this… ZERO turnovers in close to 27 minutes of play. Let’s see if he can build on this. But Tio definitely needed this. There have been well-officiated games, but there are questionable games and even boneheaded calls. I think the league should have its mid-point check with officials to explain what is going on. 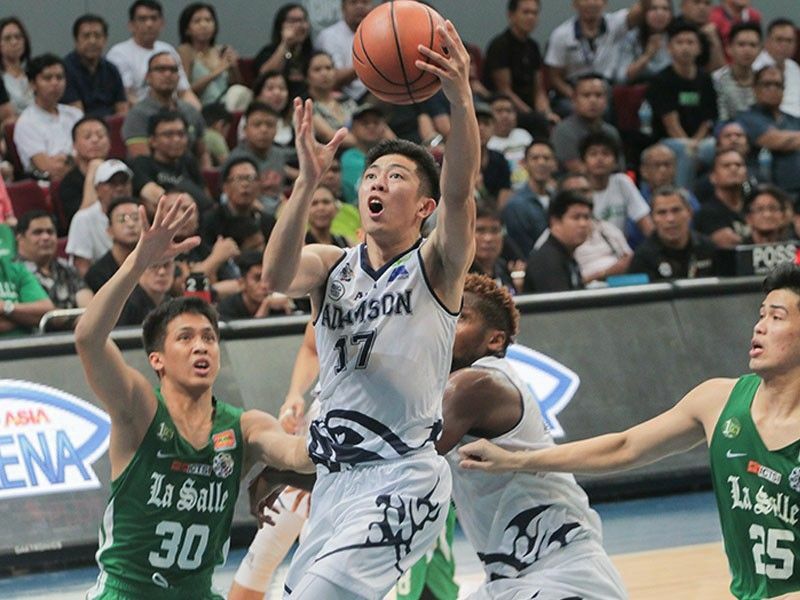 There is a lot to point out such as Nestor Sambrano’s surprising stoppage of play during the Ateneo-UP game when there was no dead ball situation after a collision between Thirdy Ravena and Paul Desiderio. Why? For a veteran referee to make that mistake should be cause for concern. I thought that officials were told to exercise restraint when coaches and players react to calls? If they penalize the coaches and players, why aren’t these referees penalized for spotty officiating?